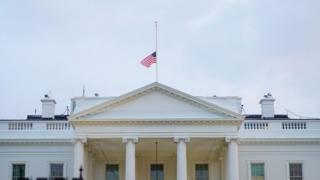 In most countries flags are flown at half-mast - or at half-staff as the practice is known in the US - as a sign of mourning following the death of a leader or senior politician, or in response to a major disaster or tragedy. In June, Annapolis Mayor Gavin Buckle asked the White House to fly its flag at half-mast after a gunman killed five journalists working at a newspaper in his city. The following day, Mr Trump ordered all flags at public buildings, military posts, naval vessels and embassies to be lowered. The White House later said the president acted as soon as he heard of the mayor's request. "This disgraceful omission is unacceptable and yet another example of our incompetent politicians," he wrote at the time. "It is a simple yet meaningful and important gesture that signifies our respect and recognition for these great soldiers who lost their lives." In reality, Mr Obama did not lower flags for the singer's death, but New Jersey's Republican Governor Chris Christie did in his state. Flying a flag at half-mast following the death of the head of state is a common practice across the world. In the UK, such tributes honour rulers of allied nations on the monarch's command. Politicians and activists criticised the decision in view of the kingdom's human rights record. Scottish Conservative leader Ruth Davidson described the move as "a steaming pile of nonsense". Mr Cameron later defended the "long-standing relationship" between the UK and Saudi Arabia, saying: "We don't agree with lots of things that the Saudis do. We don't agree with the way they treat people, for instance criminals. "But when the king died, as a mark of respect, we thought it was right to show that respect." Saudi Arabia's own mourning ceremonies are understated. Its flag is never lowered, and the late king was buried in an unmarked grave. As the law which enshrined the separation of churches and the French state celebrated its 100th anniversary in 2005, a new controversy emerged. When the government lowered flags after the death of Pope John Paul II - the head of a foreign state - many politicians criticised the decision, saying it came into conflict with the country's secular tradition. France also notably flew its flags at half-mast to mark the deaths of former US President Ronald Reagan and Soviet leader Joseph Stalin. Newspapers were quick to pick up on the fact, with the Sun asking on its front page "Where is our Queen? Where is her flag?"